It looks like it’s going to be another chaotic year in the German Bundesliga- so we thought we’d take a closer look at how the bigger clubs will be kitted out this season. Make no mistake, the Bundesliga is one of the best leagues in European football. You may be busy scoffing in retort to such a statement, ready to argue the fact that Bayern Munich run away with the title every single year. Many football fans believe that the Bundesliga is little more than an extravagant training exercise for the likes of Robert Lewandowski and Arjen Robben to flex their muscles, due to the lack of any real resistance in their title bid. However, when you’ve got teams with the flair of Borussia Dortmund, the promise of RB Leipzig and the history of Bayer Leverkusen all competing in the same league, it’s fair to say there’s going to be a couple of big surprises as the season goes on. There are some top quality teams competing this year, with a load of smart transfer business being done over the summer- and you’d be extremely naïve to think that Ancelotti’s men will have it all their own way. 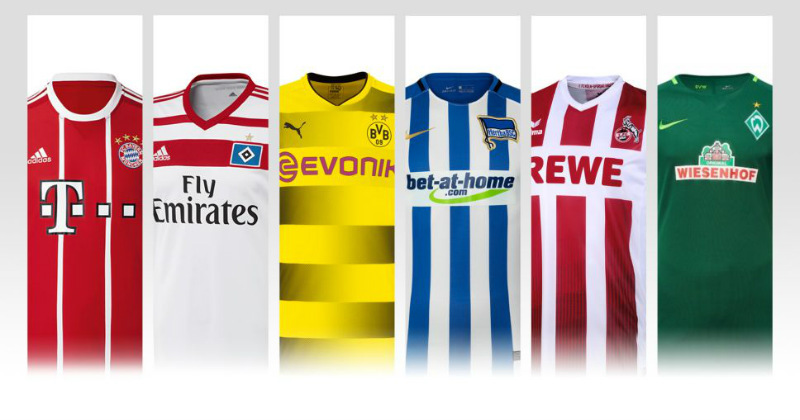 Well, amongst all the drama and incredible football, the Bundesliga also never fails to provide one very important thing: an entire catalogue of gorgeous new kits. They just love their black and red combinations over at Bayer Leverkusen, and this year’s offering from Jako certainly doesn’t break from that tradition. With a predominantly black home shirt that incorporates 11 diagonal red lines (one for every player on the pitch) Die Werkself will no doubt be happy with the sleek look of this year’s design. As for the away shirt, this year Leverkusen have opted for a reverse in the colourway- with red being much more prominent and a single black stripe running across the front. Once again sponsored by Barmenia, Die Werkself will be hoping that the new Jako strip can kick them on to a successful Bundesliga campaign. The past inspires the present. Introducing the new 2017/18 @fcbayern Home kit. Adidas are providing Munich fans with a blast from the past with their new 2017/18 strip. Inspired by the glory years of the 1970’s, the new design features thick white stripes running down the shirt front and sleeves, as the German champions harken back to the days of Franz Beckenbauer and Gerd Muller. But this year it will be Lewandowski, Hummels and co. that are wearing the Die Roten strip with pride, as Bayern bid for yet another Bundesliga title. Featuring the adidas logo, a white crew neck and sleeve cuffs, it’s fair to say The Bavarians have bagged themselves a stylish kit that looks to the future just as much as it honours the past. When your team is nicknamed “The Black and Yellows”, it shouldn’t come as much of a surprise to see those two colours feature so prominently on this year’s kit. Borussia Dortmund have replaced last season’s horizontal stripes with a series of gradient black hoops, which fade from black to yellow (and vice versa) across the front and ensure that the Puma and Dortmund logos are legible. The new home shirt will be combined with black shorts and yellow socks to complete the formidable BVB image. Following last week’s Champions League draw, something tells us Spurs fans might learn to dread the sight of such an iconic football kit. It seems to use that RB Leipzig kits have become the Marmite of football. But whether you love it or hate it, one thing we can all agree on is the new Nike design won’t fail to catch the eye this season. Incorporating the traditional white and red colour combination, this year’s kit is all about the sleeves. With a red diamond pattern and a halftone gradient, the new sleeves are the biggest change to the strip that saw Leipzig finish second in the table last term. The design once again prominently features the Red Bull logo and the famous Swoosh, as Leipzig look set to don one of the most unique football kits around. If you’re looking for the best prices on Bundesliga football kits, then you’ll be pleased to know you’re in the right place! FOOTY.COM is a price comparison site that lets you make a huge saving on some of the biggest kits around- so have a look for your favourite shirt today!